Our technicians possess the training and resources to fix your equipment in the most efficient manner possible. Franklin Equipment has extensive training requirements to certify technicians and assure that they are properly equipped to service your machines. Our technicians attend classes at our equipment manufacturers’ technical training centers to learn any new diagnostic and service techniques and to understand any changes in manuals or equipment requirements. Our technicians are trained in equipment operation, diagnostics, maintenance and repair. Franklin Equipment combines classroom training with on-the-job experience for a thorough understanding of machine maintenance and repair. Safety regulations and procedures are emphasized throughout the training process. All manufacturer classes are taught by certified specialists. There are courses on the functions and performance of specific machines, which include preventive maintenance inspections, adjustments, tests, troubleshooting techniques and repair procedures. There are also component courses, which provide more in-depth information for specialized technicians. 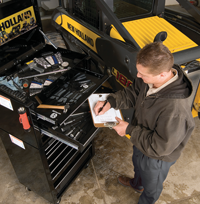 As diagnostic equipment becomes more and more complicated, training is especially critical to maintain equipment properly and optimize operating time.